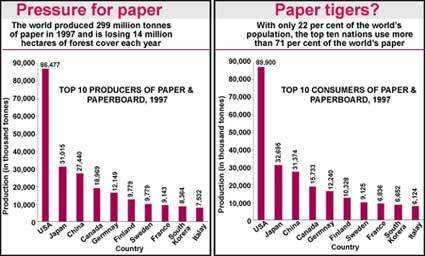 Unless governments force paper companies to invest in cleaner technologies, encourage the manufacture of recycled paper and allow plantations only on lands that are 'degraded', and not currently forested, the paper industry will continue to pollute the environment. The global demand for paper is expected to rise by 31 per cent by 2010. This pressure to produce more paper could be bad news for the environment -- from soil erosion and species loss when forests are harvested, to air pollution from pulp mills and waste incinerators, to the release of deadly dioxins by mills into lakes and rivers and the usage of thousands of litres of water.